Was added at every cast. Having disposed, for the present, of questions relating to the stage editions of the plays he recurred to his standard copy, and, to the evident surprise of Mr. McDonough, read or repeated from memory extracts from several of the plays, some of which embraced a number of lines. The heart benevolent and kind. David James Harkness and R. Gerald McMurtry, Lincoln’s Favorite Poets, p. 33. William H. Herndon and Jesse W. Weik, Herndon’s Life of Abraham Lincoln, p. 258. David James Harkness and R. Gerald McMurtry, Lincoln’s Favorite Poets, p.
Rufus Rockwell Wilson, Intimate Memories of Lincoln, p. 47 (George Alfred Townsend, “Lincoln’s Near Friend,” Cincinnati Inquirer, August 26, 1883). David James Harkness and R. Gerald McMurtry, Lincoln’s Favorite Poets, p. 10. Roy P. Basler, editor, Collected Works of Abraham Lincoln, Volume VII, p. 237 (Memoranda on Robert Burns, January 25, 1865). Rufus Rockwell Wilson, Intimate Memories of Lincoln, pp. 423-424 (James Grant Wilson, Putnam’s Magazine, February-March, 1909). Michael Burlingame, Lincoln Observed: Civil War Dispatches of Noah Brooks, p. 220. (From Noah Brooks, “Personal Recollections of Abraham Lincoln, Harper’s Monthly Magazine,, May 1865). Douglas L. Wilson, Lincoln Before Washington, p. 10. Roy P. Basler, Touchstone for Greatness, p. 207. Michael Burlingame, At Lincoln’s Side: John Hay’s Civil War Correspondence and Selected Writings, p. 137. Michael Burlingame and John R. Turner Ettlinger, editors, Inside Lincoln’s White House: The Complete Civil War Diary of John Hay, pp. 75-76. John G. Nicolay, “Lincoln’s Literary Experiments,” Century, Volume 47, 1894, p. 831. Noah Brooks, Washington, D.C. in Lincoln’s Time: A Memoir of the Civil War Era by the Newspaperman Who Knew Lincoln Best, p. 261. Noah Brooks, Washington, D.C. in Lincoln’s Time: A Memoir of the Civil War Era by the Newspaperman Who Knew Lincoln Best, p. 260. CWAL, Volume VI, p. 392. (Letter from Abraham Lincoln to James H. Hackett, August 17, 1863). Marquis de Chambrun, Impressions of Lincoln and the Civil War, p. 83-84. Charles Sumner, Eulogy of Abraham Lincoln: The Promises of the Declaration of Independence, p. 44. Osborn H. Oldroyd, The Lincoln Memorial: Album-Immortelles, p. 348. Richard J. Carwardine, Lincoln: Profiles in Power, p. 307. Roy P. Basler, Touchstone for Greatness, p. 223. Roy P. Basler, Touchstone for Greatness, p. 221. David James Harkness and R. Gerald McMurtry, Lincoln’s Favorite Poets, p. 31. David Chambers Mearns, Largely Lincoln, p. 126. CWAL, (Letter from Abraham Lincoln to James H. Hackett, August 17, 1863), Volume VI, p. 393. Michael Burlingame and John R. Turner Ettlinger, Inside Lincoln’s White House: The Complete Civil War Diary of John Hay, p. 128 (December 18, 1863). 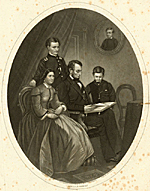 Michael Burlingame and John R. Turner Ettlinger, Inside Lincoln’s White House: The Complete Civil War Diary of John Hay, pp. 127-128 (December 13, 1863). David Chambers Mearns, Largely Lincoln, p. 120. Allen Thorndike Rice, Reminiscences of Abraham Lincoln, p. 264-267. William D. Kelley, The Philadelphia Evening Telegraph. Doris Kearns Goodwin, Team of Rivals: The Political Genius of Abraham Lincoln, p. 102. Doris Kearns Goodwin, Team of Rivals: The Political Genius of Abraham Lincoln, p. 441. Egbert Viele, “A Trip with Lincoln, Chase and Stanton,” Scribners, pp. 813-814. David James Harkness and R. Gerald McMurtry, Lincoln’s Favorite Poets, p. 24. Douglas L. Wilson and Rodney O. Davis, Herndon’s Informants: Letters, Interviews, and Statements about Abraham Lincoln, p. 679. James M. McPherson, “We Cannot Escape History”: Lincoln and the Last Best Hope of Earth, p. 83. David James Harkness and R. Gerald McMurtry, Lincoln’s Favorite Poets, p. 18.